So you’re finding out about this little gem right before I have to turn him back over to the service dog organization. We were on a long break from raising service dogs. Fast-forward a few years and I got an email from a service dog organization who needed a six-week favor: would we, could we take a 6-month old Labrador for just six weeks while that puppy’s raiser recovered from knee replacement surgery. My husband and I talked it over, looked at Lily and Tango (and Schoons, who I suspected would be overjoyed at the new addition) and agreed to take this adolescent Labrador. I picked him up five weeks ago, friends. Yes, five. I’m sorry to have kept this for so long, I had been meaning to write about it, but things just got out of hand. [Separate blog post needed for all that drama.] Our sweet Lily had died just the week before, so that meant Tango was the only senior who had to tolerate this new hooligan. Here’s what I love so much about Labradors: they are happy wherever they are. Nap time is tough when Ren has secrets to tell. This guy, Ren, hopped out of his raiser’s car and then hopped into mine like it happened every single day. He slept on the 90-minute ride home, thumped his tail when I’d reach back to pet him, and jumped out of the car when we got to the house looking like he was ready for whatever came his way. I introduced Ren to Schooner first through the fence. Tail wags from everyone, so I let Ren into the fenced backyard where a sniff-fest immediately commenced. As soon as they decided they were indeed both dogs, one of them play-bowed and they were off! Racing around the yard, getting a feel for each other’s athletic abilities, and play styles. Five weeks later, this still happens every day. Tango saw the melee and barked until I let him out to investigate this newcomer. Ren had to learn how to live with a senior dog. Tango has severe osteoarthritis and does not want to (and cannot) play with anyone at any time. Within a week, Ren learned that he couldn’t bump or shove his way through or around the old guy and they’ve lived harmoniously together since. Schooner is elated with his new plaything. For a giant dog, Schooner is both gentle and oh-so-tolerant. More tolerant than he should be, probably. Ren will see Schooner sleeping on the couch and make an air dive onto Schooner. Schoons just wakes up playing. Every now and then, Schooner will tell Ren off, usually if Ren has drawn blood. It’s not uncommon to see Ren hanging from Schooner’s big jowls while Schoons walks through the house. The first couple of weeks Ren was here, Schooner was so marked up and gouged that it looked like he’d tangled with a mountain lion. 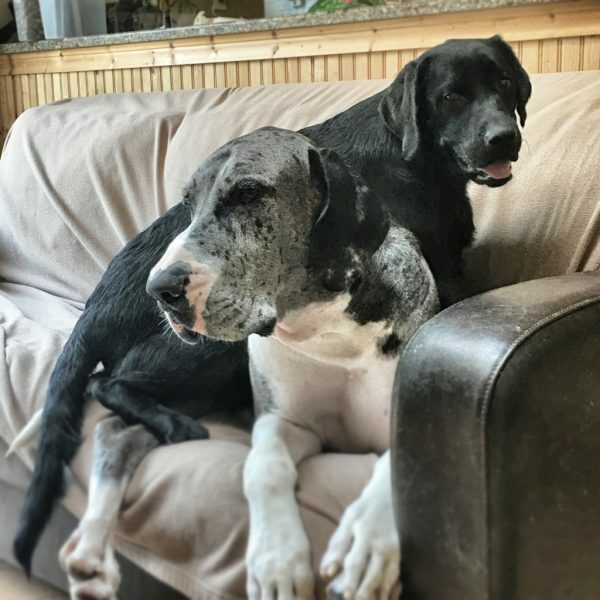 The worst spots were Schooner’s “armpits” — they’re just the perfect height for a young dog to bite into — and Schooner’s neck/jowls. Schooner’s scabs have healed, for the most part — I guess his skin toughened up over the last month or so — and there’s only the occasional bloody scratch to be found. It’s been really nice having a youngster back in the house. The energy, enthusiasm, athleticism, and boundless joy has been just what we needed. We had Ren for just a short time, but we are going to miss this guy when he goes back. He’s filled the void left behind when Nemo died. Dana again has a dog in his lap. He has a dog to greet him at the fence and carry his workout shirt into the house. He has an Adirondack chair, backyard-sitting companion. I’m a little grateful that we don’t have him any longer than six weeks. It’s crazy how quickly we became attached to this guy. We’re gonna miss him.